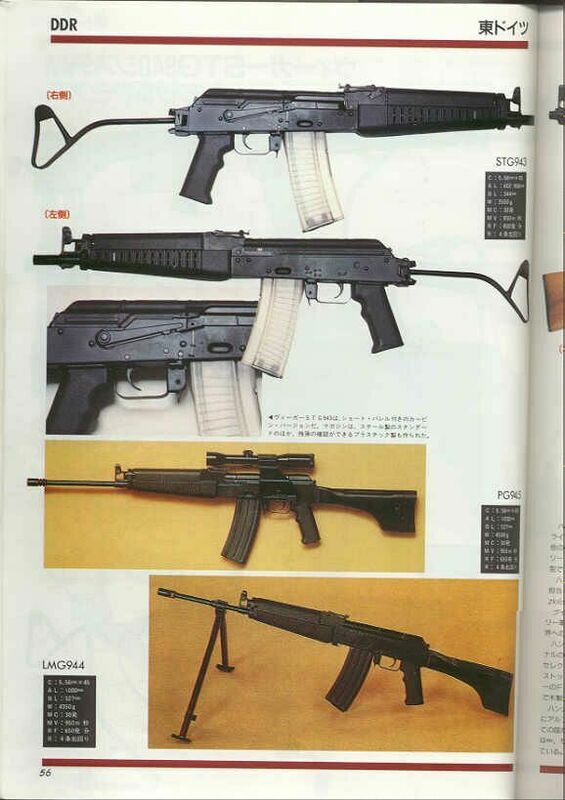 WIEGER STG-940 ASSAULT WEAPONS SYSTEM. These came from the website: http://www.moneypit.net/~bhinton/AK/ The WIEGER STG-940 assault weapons family is chambered for the 5'56-NATO cartridge. It was developed during the last years of life of the East Germany, for export but also for their special forces (the STG-943 was known to be in use with the STASI). 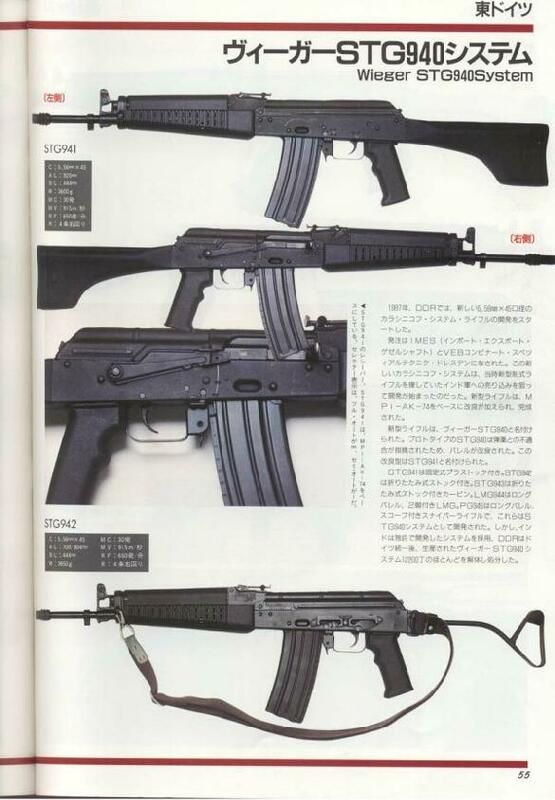 The WIEGER STG-940 family features 5 WEAPONS: STG-941 assault rifle (fixed stock, 5'56 30-rounds magazine, Safe- Full auto- Semi auto trigger group, total length: 920 mm). STG-942 assault carbine (folding stock, 5'56 30-rounds magazine, Safe- Full auto- Semi auto trigger group, total length: 915mm). STG-943 special purpose carbine (folding stock, 5'56 30-rounds magazine, Safe- Full auto- Semi auto trigger group, total length: 344mm with stock folded). LMG-944 light machine gun (fixed stock, 5'56 30-rounds magazine, Safe- Full auto- semi auto trigger group, under barrel folding bipod, total length: 959mm). PG-945 sniper rifle (fixed stock, 5'56 30-rounds magazine, semi auto only, total length: 950mm).